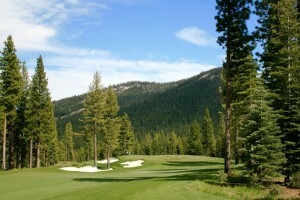 Truckee, Nev. – To round out Martis Camp’s one-of-a-kind amenities, the development team of this highly successful private golf and ski community located in North Lake Tahoe will open the Martis Camp Club’s signature amenity this July: the Camp Lodge, an impressive and iconic architectural masterpi ece. From its site atop a 70-foot rock outcropping overlooking the 18th hole of the Tom Fazio-designed golf course, the Camp Lodge features dramatic 270-degree views of the Carson Range, Lookout Mountain and the Sierra Crest. Influenced by great National Park lodges and established clubs of the 1900s, the goal was to create a building that will have a lifetime of 100 years or more. Sather’s idea was to develop a building that conveyed heritage, rather than rely on trends and the latest design style. 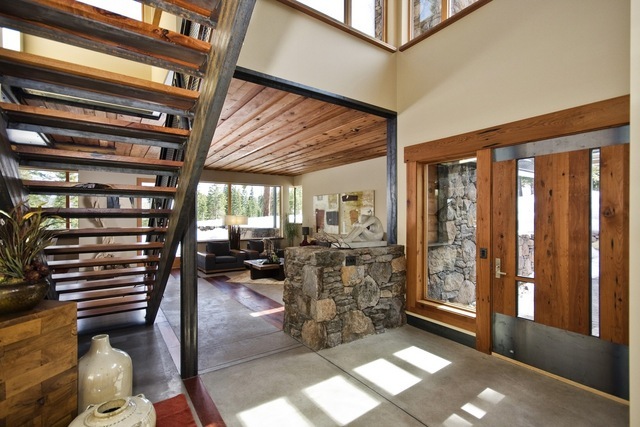 Given Tahoe’s amazing weather with abundant sunshine in the summer and winter months, the intent was to create a real indoor/outdoor feeling through a floor plan that began with the site itself. The west side of the Camp Lodge hangs right over the edge of a spectacular natural rock outcropping and many of the indoor spaces open themselves to bring the outdoors in. “To capitalize on Mother Nature’s landscape design, we created terraces that cantilever over the cliffs to give you a sensation that you are one with the view,” said Sather. And because there is life after golf, the Camp Lodge will feature a full-service day spa with a delightful menu of massage and therapeutic treatments, outdoor lap and vitality pools, men’s and ladies’ locker rooms, fitness area, golf shop and community post office. With four indoor dining rooms and five patio areas, Club members will have their choice of casual and formal dining areas that accommodate small intimate gatherings or large celebrations. The hallway leading to the dining spaces is an accommodating art gallery. The Gallery Hallway will be full of original artwork of the Sierras in addition to other original works. The rest of the clubhouse spaces will be filled with an eclectic mix of appropriately influenced art in the ladies’ locker room and spa to more naturally themed art for the men’s locker room and fitness studios. Martis Camp provides families the ultimate Tahoe lifestyle through a distinctive mix of four-season amenities, unsurpassed natural beauty and a refreshing culture of family, friends and community. The Camp Lodge is the crown jewel in an unrivaled amenity package for Martis Camp Club members, which includes a Tom Fazio-designed golf course, direct ski connection to Northstar-at-Tahoe Resort, with Martis Camp Express high speed quad lift and private Ski Lodge, 18-hole Putting Park, Family Barn with art loft, indoor basketball, soda fountain, movie theatre and a concert amphitheater, 26-mile community trail network, Lost Library, Folk School and Park Pavilion with sporting fields and fishing lake. Named Top Second Home Community in the March 2011 issue of Barron’s, Martis Camp is a collaboration of DMB Associates and Highlands Management Group of Scottsdale, Ariz., developers known for some of the most recognized and successful communities in the west. Beyond its amenity offering, life at Martis Camp is defined by an incredible array of homes and cabins that reflect inspired mountain architecture. Homesites are priced from $495,000 and homes from $1,795,000.